In order to obtain the CPE certificate, you must view/read the entire program, complete the test with an 80% passing grade, and complete the evaluation. Re-take the test as many times as needed (after you submit your answers, the screen will show correct answers in green and incorrect answers in red text). For webinars, the test simply asks you to certify that you completed the course – complete the evaluation to access and print your certificate. To access your tests, log in to your Account. Click on Member Area, then click on the Tests/Certificates button on the left side bar. Under Tests/Certificates, you will see the tests for all products you’ve purchased or been sent. To begin a Test, click the “Start” button. If you are interrupted and cannot finish the test, you can save the test and come back to your Tests page at any point in time to finish it. *Free Webinars and Partner Organizations – Please see instructions below. Note: If you are part of a group that purchased additional certificates for a webinar or course, the person who purchased can send the Test to your Member Area from his or her Tests/Certificates page. 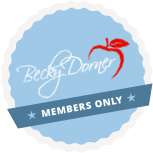 All participants must create an account on beckydorner.com to access Tests/Certificates. Once the evaluation is submitted, you will be redirected back to your Member Area, within Test/Certificates. Click on the Download button to the right of your completed program to print your certificate and/or save it to your computer. If you’ve been given access to our courses through one of our Partner organizations (i.e. CMS Region IV QI Initiative, Hormel Health Labs, etc. ), you can access the course through the Partner portals. Go to the Partners page and click on your organization and follow the instructions. If you wish, you may also submit evaluations of the quality of the activities/materials on the CDR Website at www.cdrnet.org. Please refer to our FAQ page or contact us.